Located just one block from the Las Vegas Strip, these contemporary condo suites are perfect for families and groups. Tastefully appointed guest rooms and relaxing pool give guests a welcome reprieve from the bustle of the Strip. This all- suite hotel offers complimentary breakfast and manager's reception, a relaxing pool and a fitness center. Comfortable suites enable guests to relax by the opulently landscaped pool or dine at the Three Palms Cafe. This hotel and casino with a luxury spa also features a Wildlife Habitat and a 15-acre Caribbean-style water playground. 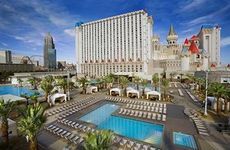 Located on the Las Vegas “Strip,” hotel features a pool, state-of-the-art fitness center and on-site casual dining. Flamingo Hilton has studios, one- and two-bedroom suites allowing guests to relax overlooking rushing waterfalls. The Hyatt offers a self-registration kiosk, free "e-room" for internet and printing, and a full fitness center. The Vegas Club has 400 rooms as a great place to rest, offering access to nearby resort pools and gaming facilities. In the heart of The Strip, this resort has 3,000 rooms, 4 different pools, a world-class spa, & multiple dining options. Specializing in extended stay, the 256-suite Resident Inn is a mile from the strip, in the heart of restaurant row. This Residence Inn offers free high-speed internet, shuttes to the casinos, and a good set of activity facilities.